Starring David Harbour, Milla Jovovich, Ian McShane, Daniel Dae Kim, Sasha Lane, Penelope Mitchell, Brian Gleeson, Sophie Okonedo, Alistair Petrie, Mark Stanley, and Thomas Haden Church. Be careful what you wish for. That goes double when asking Hollywood for anything. Right out of the gate I will admit I’m not too familiar with Guillermo del Toro’s take on the Hellboy comic book lore, just that I briefly remember watching parts of both of them, admiring the practical effects and charm on display. 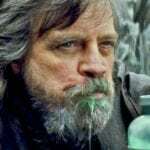 As with everything Guillermo del Toro does, he cared about the projects (and so did Ron Perlman who was practically born for the role of the titular demon spawn superhero) and inserted his love for all things weird and cinema into the franchise; I’m not going to say no one cared making this reboot, but things certainly went haywire somewhere early on. It also wouldn’t surprise me if this was a case of a studio clashing with a filmmaker’s vision. Reason being is that halfway through Hellboy, director Neil Marshall (known for The Descent, but also majorly noteworthy for helming key episodes of Game of Thrones and Westworld) gives the eponymous character a moral dilemma; he was raised to protect the world by killing monsters, but begins questioning if humans are the antagonists in this age-old dynamic. His human father (played by Ian McShane, who couldn’t be any more bored and in paycheck mode) makes a joke of this by saying he’s just turned on by the resurrected ancient Blood Queen Nimue (Milla Jovovich, who actually might be the best part of the movie, finely embodying the sorceress with seduction and malicious power). Daniel Dae Kim is added to this conversation, playing a soldier with his own personal reasons for despising all monsters. Unfortunately, none of this goes anywhere (the plot point actually feels dropped to an extent), and Hellboy ends with the hornless big red fella slaughtering otherworldly creatures, prompting one to wonder what the point was in the first place to give the character such a confliction. Maybe there is another version of the movie out there that is more character driven. If there is, it is undeniably better than this flaming piece of garbage. Narratively, the film makes zero sense, as Nimue (who is rapidly having her scattered body parts at the demise of King Arthur centuries ago recovered by a demonic pig that looks ghastly thanks to some heavily outdated CGI, as part of a revenge scheme on Hellboy) apparently needs a king (in this case, Hellboy) to bring about the apocalypse. 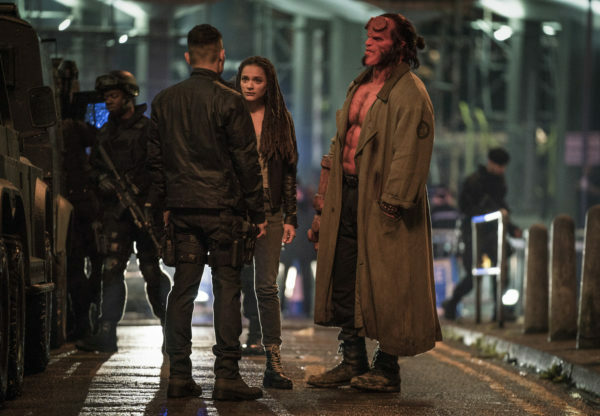 Meanwhile, Hellboy needs to uncover legendary weaponry just to be able to contend with Nimue in a fight, leaving anyone with a brain wondering why exactly she can’t just start a new world by terrorizing the current one herself. It’s one thing to be regressive with gender politics, but the movie could at least contain sound logic. I’m also aware practically no one is coming into this movie looking for a good story, which is also unfortunate because moviegoers are not going to find a good anything here. David Harbour (Stranger Things) is not a suitable replacement for Ron Perlman, constantly sounding more of a whiner rather than someone with understandable problems. The cheesy one-liners and sarcastic humor are terribly written and frequently fall flat, and the makeup effects feel overdone. To his credit, his performance never gets as bad as Ian McShane’s downright embarrassing final moments, but it’s safe to say that no one but Milla Jovovich is coming out of this unscathed. Starring in the equally ridiculous and somewhat similar Resident Evil (one franchise is an adaption of video games, whereas watching Hellboy feels like playing a poorly crafted video game that should never have seen the light of day) movies has unquestionably given her some guidance on how to act out the B-movie material here; everyone else is either phoning it in, terribly delivering comedic lines, or playing things too straight. Then there’s the action sequences, which save for an impressive and lengthy tracking shot of Hellboy battling three giants surrounded by a number of swirling camera movements, lack imagination and feel over as soon as they begin. 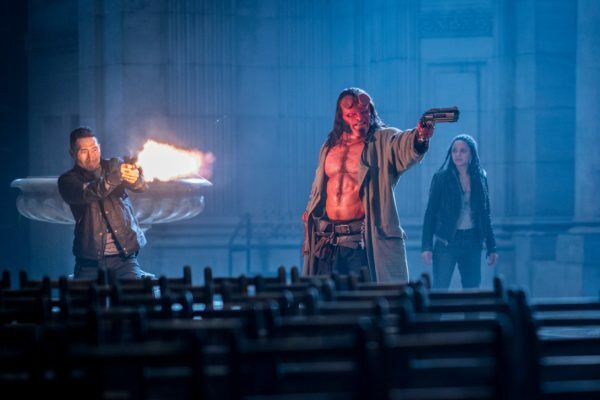 Hellboy is the rare case where the R rating is a hindrance if anything, as now all the filmmakers are doing is focusing on blood splatters and severed limbs, but it’s violence with no weight or consequences. There are at least five times in Hellboy where I felt like I was supposed to lean over and pick up a controller off of the AMC dine-in table to start mashing the Square button. 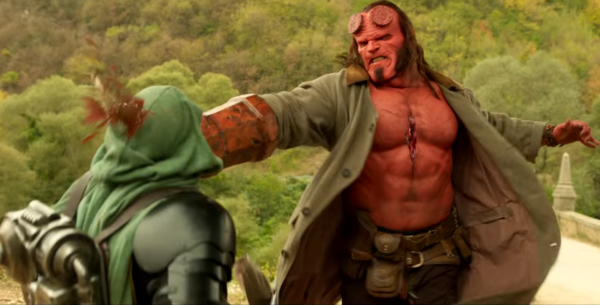 Just about every fight scene is as generic as a random encounter with video game enemy fodder, which is probably why the segment with the giants is such a refreshing change of pace; it feels like a boss battle where multiple things have to be done in order for Hellboy to win, plus it’s also directed strongly. Hellboy is also baffling when it comes to characters randomly transitioning from scene to scene wherever the plot requires them to be, completely ignoring passages of time. At one point, Hellboy is told to find the remains of Merlin alongside some notes on how to get to the secret location, which kind of just happens with voice narration as the characters walk along paths. It’s as awkward as it sounds, but not out of place with the rest of the movie in regards to having no natural flow. For as easy as the story is to understand and digest, it’s also told with absurd amounts of exposition and sidetracking that’s about as interesting as watching paint dry. And once again, the CGI is extremely bad; there is a woman capable of communicating with the dead by creating a psychic link where a ghoulish looking version of the deceased extends from her throat out of her mouth, and while it’s definitely imaginative it also appears that no money whatsoever went into making the effect come across as passable. There are kernels of decent thematic ideas and creative powers in Hellboy, so it’s difficult to believe that the filmmakers didn’t try. However, the end result is horrific, it’s a bunch of scenes connected to one another that advance mindlessly boring violence over anything substantial. Worst of all, as the film seemed to be reaching its climax, another development occurred that prolonged the story by another 30 minutes. This isn’t just the reboot continuation of the cult favorite franchise that no one wanted, it’s a version of Hellboy that is impossible to imagine anyone enjoying period. Somewhere out there right now Guillermo del Toro is crying to himself saying “sometimes dead is better”.